In this edition; news of a Hollywood-inspired cafe opening in the Fillmore, a sushi and sake bar debuts in a Japantown space vacant for more than three years, and more restaurant-related news. An anonymous Hoodline tipster reports that Hollywood Cafe on Fillmore is opening in the former Won Mi Korean BBQ space, which closed last year. 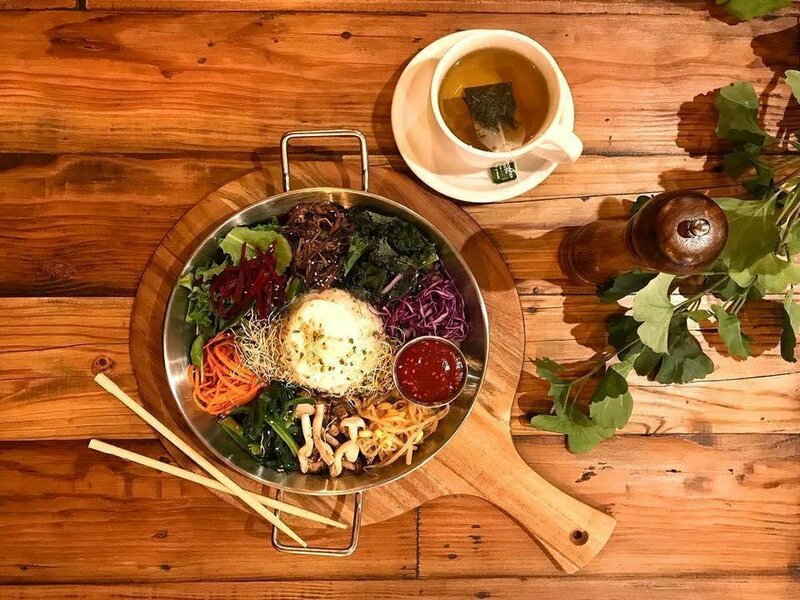 According to the restaurant's website, the new eatery will specialize in American-style breakfast and lunch fare, with Korean meals served for dinner. It's not clear, however, if the restaurant is connected to the popular Fisherman's Wharf staple, Hollywood Cafe--both maintain separate websites and feature different menus. We've reached out to both locations to learn more but haven't heard back as of press time. 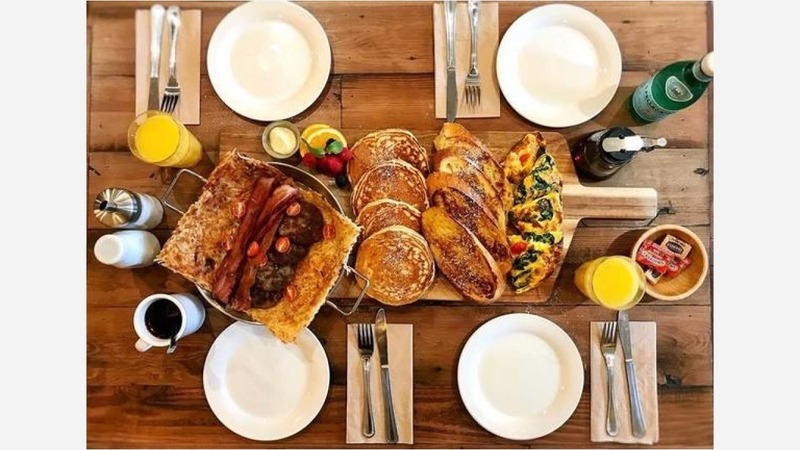 When the new spot is open, look for breakfast dishes like the "Green Mile" with toasted French bread topped with Swiss cheese, sauteed kale, scrambled eggs and avocado, and "The Silence of the Lambs" omelet with salisbury steak, mushrooms and caramelized onion served with stir-fried rice and beef brown sauce. As we reported in February, a new Japanese spot called Hikari Sushi & Bar was in the works at the former Toraya Japanese Restaurant space, which has been closed since 2014. 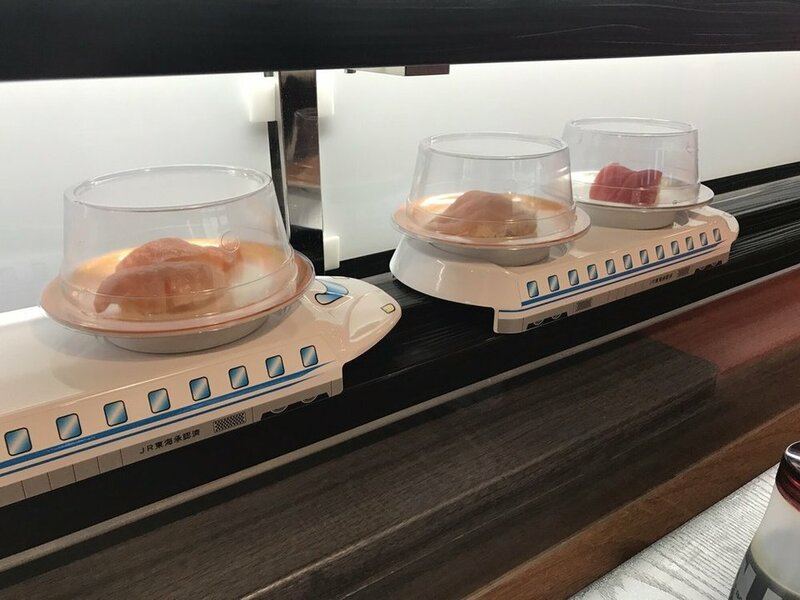 Now that the restaurant is open, tipster Al stopped by to grab a bite to eat and said the new restaurant features kaiten sushi, also known as conveyor belt sushi. It's said to be San Francisco's "first bullet train sushi," complete with Japan Railroad Shinkansen model trains delivering plates of freshly prepared rolls to diners seated at the bar. While the restaurant currently does not have a website, Yelper Brian J. reports that customers at the bar place orders via a display screen above the table. "Scroll through the iPad, click away and then be sure to press order," he writes. "Moments later, a tray of sushi slides out of the wall with your food." And when you're finished, "press the red button to return your empty plates." 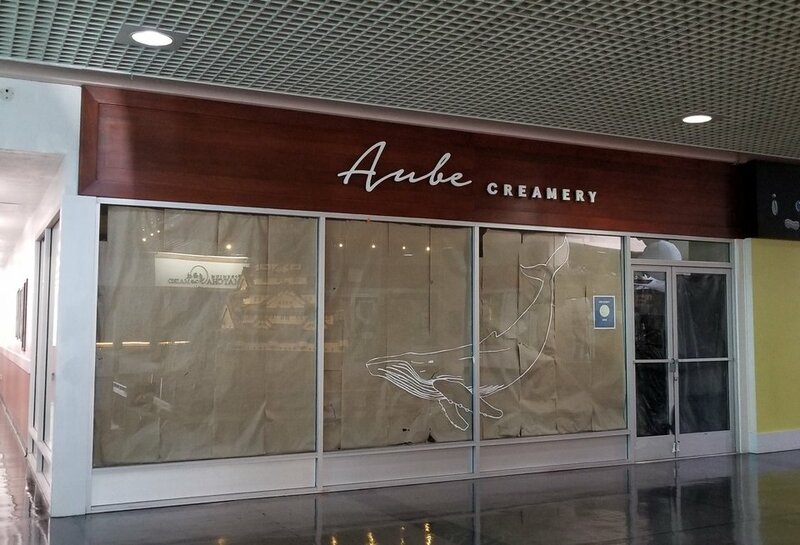 Also in Japantown and just across the street from Hikari Sushi & Bar in the Japan Center Mall, is a new dessert spot called Aube Creamery that is currently under construction. An online job posting indicates the new spot will specialize in soft-serve ice cream and shaved ice. According to the listing, its namesake is the French word meaning "dawn" or "fresh start." The business will feature a house-made ice cream base with "fresh ingredients daily without any artificial flavors," the post continues. We'll keep an eye on the space and provide updates as warranted. As we reported in January, Doppio Zero is poised to take over the former Caffe Della Stelle space, which closed after its owner retired. 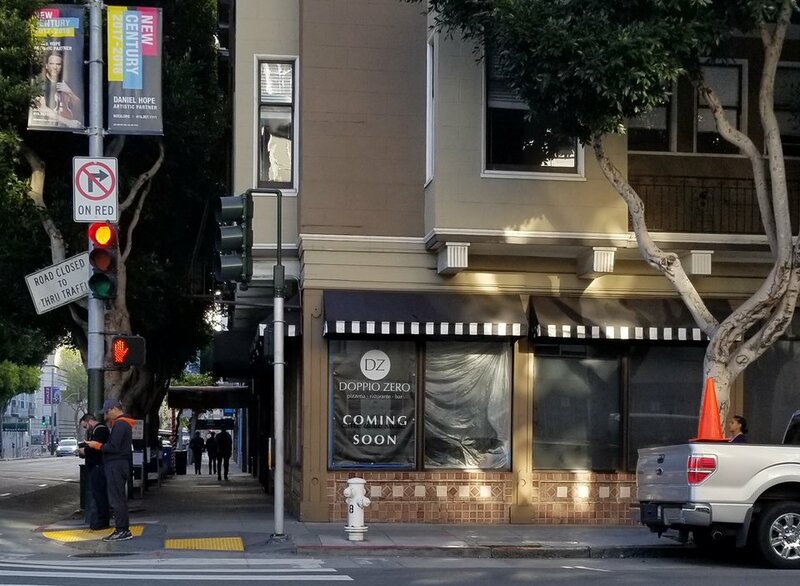 Now, the pizzeria appears to be getting closer to its debut, according to veteran tipster Al M.
This will be the first San Francisco location for the expanding Napoletana-style eatery, which comes from Angelo Sannino and Gianni Chiloiro, co-owners of FiDi's The Meatball Bar. Doppio Zero already has outposts in Cupertino and Mountain View and coincidently, the partners are also set to open a second location of The Meatball Bar in Hayes Valley a few blocks away. Doppio Zero pizzaiolo Alberto originally hails from Napels, Italy, and specializes in Southern Italian cuisines and regional dishes from Campania, according to the business' website. 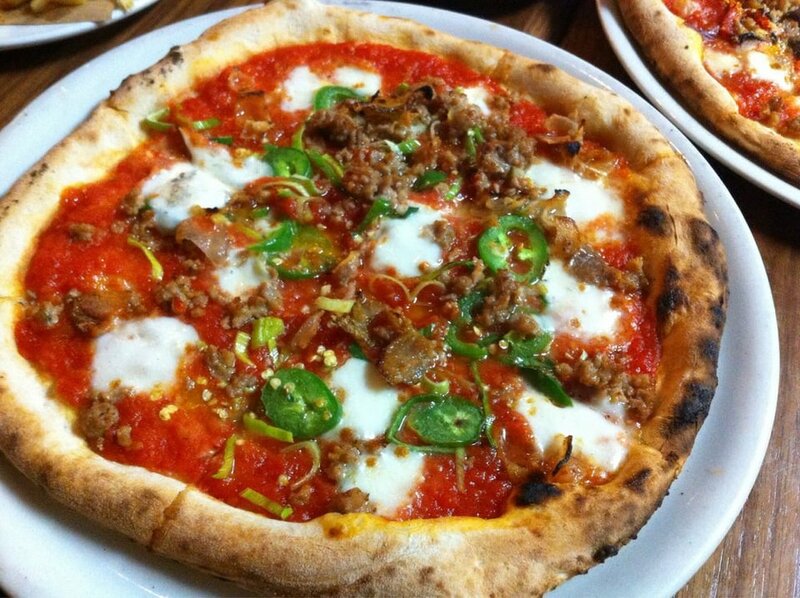 On the dinner menu, expect to see pies like the Pulcinella with San Marzano tomato, eggplant and smoked mozzarella; jalapeno with salami, spicy sausage and leeks; and a white pizza with cream of pistachio, Italian mortadella and basil. If you're in the mood for something a little different, there's an assortment of pasta dishes like house-made meat lasagna and wild boar fettuccini with pecorino Sardo cheese; and entrees like Cornish game hen marinated with herbs, garlic, white wine and Italian chilies. Shoutout to Al M. and our anonymous benefactor for the tips!